A long queue of people waits patiently at a door. Old and young, in small groups or alone, everyone waits silently. Every year, the author who lives in the house on the other side of the door will choose the first in line and write that person's story. At the head of the queue is a woman carrying a baby in her arms. But that night, the author is startled out of her sleep by a man in her room. He is from the queue, but is not first in line. He is pleading for his story to be told, believing himself to be too nondescript and insufficiently interesting ever to justify his turn. After some conversations with him, the author is, almost reluctantly, but with some strange willingness, drawn into first providing the man with a name, Alvar Eide, and then into sitting down to start his story. And so begins the story within the story. Alvar, age 42 and with a "comb-over", works at an art gallery in a small town in Norway. His parents are dead, he has no friends and has never been in a relationship. He lives alone in a small flat; lives a very regular, predictable existence; and is very good at his job, selling, framing and doing minor restorations on the works of art at the gallery. We are drawn in to Alvar's life, learning a little about his childhood and how he has become the adult he is. He understands the paintings in the gallery and through his emotional instinct and attunement, is able to relate to his customers, knowing instinctively which piece will suit them, and cleverly yet honestly persuading them either to buy or to avoid certain works. Karin Fossum wonderfully draws us into the story of the insecure yet sensitive Alvar, as his ordered life gradually becomes more and more out of control after a small good deed leads to a destruction of all his values. At the same time, we continue to witness the writing of the novel, as Alvar visits the author to express his concern at the way events are going, and otherwise to try to influence her telling of his story. We realise that Alvar and the author are very similar in character, and by the device of making the novel's character a "real person" to its author, we see tantalising glimpses of the creative process as well as gaining insights into the character of the author herself. 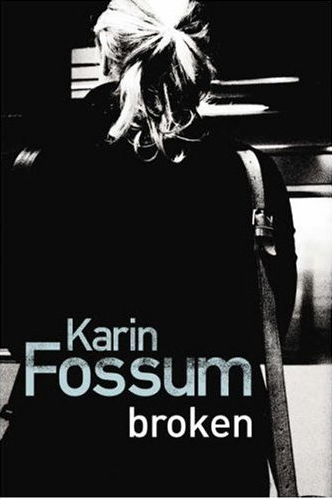 BROKEN is a wonderful, haunting book, full of powerful, overwhelming emotions, yet written with Karin Fossum's usual economy of style. The minutiae of Alvar's daily life are as compelling as the dramatic closing chapters of this brilliant story. Read another review of BROKEN.